This article was written by Hannah Barr, published on 24th October 2013 and has been read 2667 times. Hannah is studying Theology at the University of Exeter, and is spending her year abroad studying at the University of Ottawa in Canada. Here is her insider guide to surviving (literally) in Ottawa over the winter and beyond, with top tips about getting there, sightseeing, food, the university, and keeping warm! It’s hard to sum up Ottawa in just one Mole Diary; words cannot really do justice to just how much of an incredible city it is. I absolutely adored living there and miss it terribly. The capital city of Canada, people often haven’t heard of Ottawa and the common misconception is that Toronto is Canada’s capital – do not let the locals of Ottawa hear you say that! Legend has it that Queen Victoria chose Ottawa to be the capital because of the hill where the Parliament building now stands; the historical reality is slightly less romantic and points out that Ottawa was safely far enough away from the Americans and the French for the British to keep their claim on the Dominion of Canada. It was a good move! No guide can ever be comprehensive enough, but after a year of living in what I think is the best city in the world, here’s my insider’s guide to the incredible city of Ottawa. Ottawa International Airport is the second best in the world, and has the award to prove it. It has an indoor waterfall and genuinely does smell slightly of maple syrup. The bus company in Ottawa is called OC Transpo and you should expect to hear lots of stories of busses toppling over in the snow. And if you’re really lucky, you may be involved in a bus crash like I was. I can’t stand OC Transpo, but that’s probably got a lot to do with nearly getting trapped on one of the busses, late at night in a part of the city I’d never been to before. If in doubt, walk. It’s an alien concept to the Canadians who will get the bus over a five-minute amble. Anyone who comes here for their year abroad will really benefit from Ottawa’s capital city status because of the sheer the wealth of things to see and do. First and foremost, get yourself to Parliament Hill! In the summer, there is a light show where the history of Canada is projected onto the central block edifice and it is stunning, (and also slightly intimidating to be surrounded by cheering Canadians). In December, the hill is a hub of activity again with the annual Lights Across Canada celebration where notable buildings across the country are lit up for Christmas. In Ottawa, the celebration comes complete with Beaver Tails, hot chocolate and the special guest of…a politician! Also check out the hill for protests and celebrations on bank holidays. For students, museums are free on Thursday evenings, apart from the Currency Museum which is free all the time. Ironic. Sure some of the exhibitions are a bit cheesy, but let’s be honest, you’ve always wanted a photo where you’re posing with a taxidermy polar bear in the Museum of Nature. Definitely go to the Museum of Civilisation and choose a sunny day so you can stroll along the Alexandra Bridge into Gatineau and see a stunning view of Parliament Hill. Other favourites of mine were the National Art Gallery and the Bytown Musuem. In the summer, take a boat cruise along the Rideau Canal and hop on an open-top bus for a tour which will take you to such sites as the first portaloo commissioned for the Queen. You’ve also got to explore Byward Market in all seasons, from summer exhibitions to Christmas tree displays and horse-drawn wagon rides in the snow. 1. Zak’s Diner – open 24 hours, comes with complimentary bubble gum and has staff who are suckers for British accents. 2. Royal Oak on Laurier – right next to the uOttawa campus and the perfect pre-evening lecture dining experience. 3. Father’s and Son’s – they do a legendary weekend brunch to help you get over your Friday and Saturday nights. 4. Beaver Tails – this place will become your best friend. I don’t want to ruin the surprise and joy of discovering these delights and I don’t think my words can do justice to the heavenly creation that is the Beaver Tail. 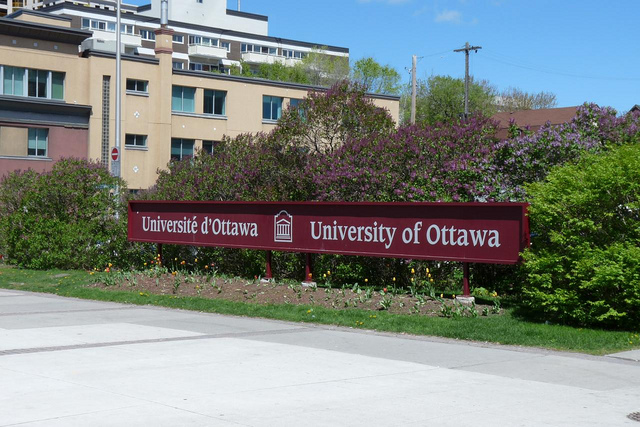 The oldest bilingual university in Canada, uOttawa is a fantastic place to study abroad and I adored my time there! Housing – don’t expect to be given their Rez accommodation if you’re a British exchange student; I lived in an apartment off-campus and loved it. Even if I did have a few translation issues with my Quebecois roommate! Miming toilet paper: it’s harder than you think. Activities – hook up with the international group on Facebook for trips to parks full of moose and bison, heritage villages and other quirky Canadian treats. Also look up the GeeGees recreational activities for once-in-a-lifetime adventures like whale-watching, canoe-camping, dog-sledding and winter-camping. Lectures – 8.30am starts and 10pm finishes. It’s intense, but your body soon adjusts, especially when it seems to become a competition amongst students as to who can bring the most extravagant “snack” to classes. I took a variety of arts classes and I cannot recommend them highly enough. If you have the option, take some Native Studies classes; I got to participate in First Nations ceremonies and got to visit a reservation which was heart-breaking and fascinating in equal measure. And if you ever see any classes whose lecturers are Emma Anderson, Seymour Mayne or Georges Sioui, take them! They will be the best ones you take. My main advice when it comes to class selection is to be adventurous: you haven’t flown 4000 miles to study British things. Pick courses in things you can’t at your home institution; as long as you can justify your choices and how they help your degree, them embrace the new opportunities. Have you ever wondered what your life would be like if it constantly felt like there were obese woodlice having a good time in your nostrils? Well, if you go to Ottawa in the winter, you’ll find out! That is the sensation of frozen nostril hair, a delightful experience that you never quite get used to. 1. Get a good coat. Sounds obvious, but a good coat will literally save your life. Which is good, because it will kill your bank balance. You’ll be looking at a minimum spend of $100. 2. Frost bite warnings aren’t a joke. If you hear one, do not go outside without gloves, scarf and ear muffs otherwise they won’t be there when you get back inside. Even if you’re popping down the road, take them! 3. Boots with good grip, good lining and that go a good way up your leg. Frozen rain is a treacherous thing still tripping you even when it’s technically spring. 4. Don’t wear too many socks. They soak up the heat and leave your toes getting bluer and bluer. This means layering carefully. The outside is -40 but the inside is sweltering so you soon learn to perfect the art of casually stripping as you step into buildings. 6. Go skating on the Rideau Canal. Or, if you’re anything like me, go “skating” on the Rideau Canal. 7. Check out Winterlude in Confederation Park. Get blown away by how talented people can be with ice! Get it on an ad-hoc hockey game happening in the middle of the road. Rejoice in the fact that your heating bill is included in the rent so you can have it as high as you like! My main advice for going on a year abroad to Ottawa, or in fact anywhere, is to just embrace the idiosyncrasies and throw yourself into your new life. It may be your only opportunity to live abroad so get on and live it! For the latest update from Hannah, check out her blog, 'A Theologian in Canada'! Our Mole Diaries are insider city guides written by students about their experiences, filled with top tips and recommendations. Please view our 200+ Mole Diaries arranged by language, and if you&apos;d like to contribute, do find out more about becoming a Mole! How much money will I need to study abroad in Canada?